Magdeburger Joe.com: Is There a Pro Obama Bias in The Media? John McCain is understandably upset about the New York Times rejecting his rebuttal to a column written by Barack H. Obama and published in the New York Times earlier. McCain claimed that the objections of the editor went well beyond style and were an attempt to substantially alter statements of opinion. Those who want to read the rebuttal had to go to drudgereport.com. McCain has every right to be angry at the New York Times for their coverage of his campaign. Mr. McCain should know, however that he is in good company. During World War Two, the New York Times buried its Holocaust Coverage inside the paper, well away from page one . Of 24,000 front page stories between 1939 and 1945, only twenty six stories dealt with the Holocaust. Of those, only six stories mentioned the focus of liquidation efforts on Jews. Its infamous coverage of the Ukrainian famine in the early thirties went well beyond downplaying or even neglecting the story. 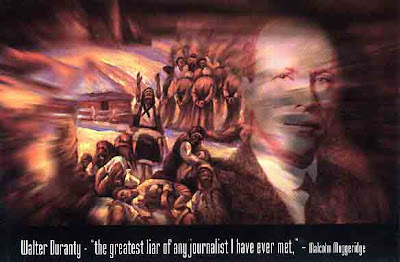 Walter Duranty won a Pulitzer Prize for himself and undeserved prestige for the New York Times for filing glowing reports of the success of forced collectivisation in the Ukraine. As the readers of the New York Times read about joy in socialist paradise, a man made famine was sweeping across the Ukraine. Unreported were instances of people eating dogs, cats and squirrels. Actual cannibalism, documented by those with no political agenda went unreported in the New York Times. The damage inflicted upon doomed Jews and Ukrainians by the editors of the New York Times is incalculable. Newspapers around the country and around the world look to the New York Times for guidance in prioritising their international news. A decision to shine a spotlight on a government's atrocities can save lives . Countries concerned about their image abroad sometimes respond to negative publicity. The worst thing that can happen to a group targeted with genocide is to have a major news outlet lead a coverup. This is exactly what happened to the Ukrainians. George Bernard Shaw and Walter Duranty are a few of may who because of bribery or ideological blindness denied the existence of a famine in the Ukraine. Malcolm Muggeridge and a few other brave journalists kept the world informed at great risk to themselves. In 1932-1933, millions died. Estimates range from 2.5 million souls to as many as ten million. In a country where for years it was hard to even get a telephone book, it is difficult to reconstruct details from official records. The democratic government of Ukraine has no interest in covering up this dark chapter in its history. The millions killed are finally getting their belated recognition. The market economy in America is inflicting serious blows upon periodicals and broadcast outlets that slant and falsify the news. The New York Times as seen its circulation plummet. Biased papers such as the New York Times are going the way of collective farms and five year plans. The internet and talk radio are viewed with fear and contempt by the ditzerati of the liberal media . McCain should not worry about being denied space in the New York Times. Its once lofty platform sinks deeper by the day into the swamp of public indifference. Their bias against him has generated far more interest in his rejected article than if they would have printed it. The public is well aware that reporters frequently bring a personal bias to news reporting. Today, the public is more skeptical than ever before. And in the age of the internet , we have choices. Don't worry, Senator McCain. Help is on the way.